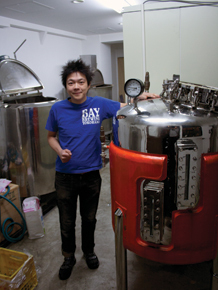 Suzuki Shinya opened his brewpub, Bay Brewing Yokohama, in August of 2011. After receiving his license in early 2012, he began brewing on his small premises, finally serving his beer in the Spring. Having his own brewery was always Suzuki’s dream, but his dreams aren’t all complete yet. Suzuki originally trained in Germany and the Czech Republic, where he learned traditional styles like the lager, pilsner and weizen. After two years as an assistant brewer at Yokohama Brewery, he became head brewer and, toward the end of that two-year tenure, began brewing American-style IPAs. These boldly flavored brews, which use a lot of hops to make them especially complex and bitter, were named after famous professional wrestling moves and gained him considerable fame for their excellence. He didn’t forget his roots, however, and also brewed a delicious imperial pilsner (high alcohol version). 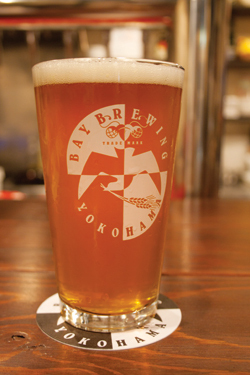 At the casual Bay Brewing brewpub, Suzuki and his assistant Ando serve seven craft beer selections; roughly four or five of them come from around Japan, while the rest are his own unique creations. Their limited food menu mostly features fries and other good beer-pairing munchies. Beer lovers always look forward to Suzuki’s new releases. Suzuki, meanwhile, looks forward to turning Yokohama into a true beer destination—that’s his real dream.